What do you get when you combine COLLIDE Theatrical Dance Company, known for creating original dance musicals, with the History Theatre, dedicated to creating new work based on or inspired by true events in Minnesota history? 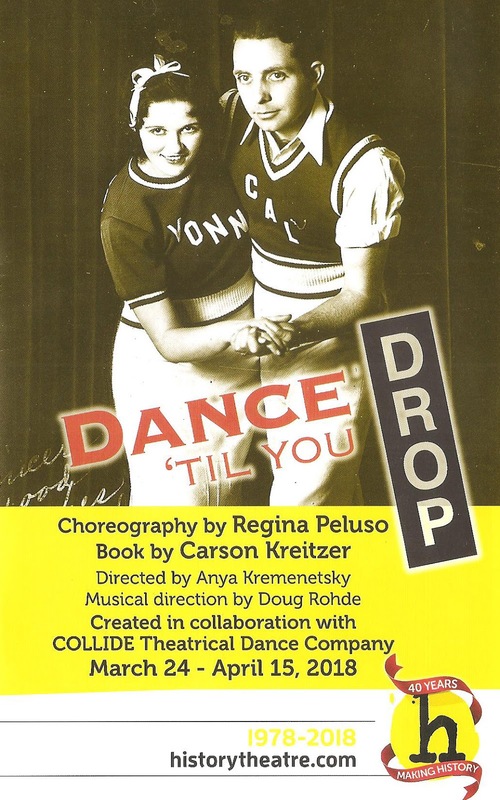 You get Dance 'Til You Drop, a dance musical about a Minnesota dance team who competed and set a record in a dance marathon in the 1930s. Let's call it an original historical dance musical! Like all COLLIDE productions, it features exquisite storytelling through dance, and like all History Theatre shows, it's an informative and compelling look at history and how it relates to today. It's fun, inspirational, nostalgic, and over in a quick two hours that will leave you wanting more. The sparse script by Playwrights Center Core Writer Carson Kreitzer creates a framework within which the dance tells the story. We meet Minnesotan Callum deVillier (an always wonderful Pearce Bunting) in his St. Louis Park barbershop in 1969, and he soon waxes nostalgic about that time that he and his partner Vonny Kuchinski danced for 3780 hours straight at a dance marathon in Massachusetts. That's about 157 days, or 22 weeks, dancing 24 hours a day with a 15 minute break every hour, in which sleeping, bathing, and any other necessities of life must be conducted. They ate while dancing, and often slept standing up, supported by their partner. That's unbelievable, and it's no wonder that dance marathons were eventually banned in many states due to the health concerns. The things people do, right?! In the flashback that makes up the bulk of the play, Pearce Bunting becomes the Emcee of the dance marathon, keeping the dancers in line and entertaining the crowd, like a reality show host. He and Katie Gearty sing songs of the era accompanied by the awesome onstage band, with musical director and arranger Doug Rohde on piano. Cal is embodied by Patrick Jeffrey, with Andrea Mislan as Vonny, and the two create a beautiful dance partnership, conveying all of the emotions of the experience through movement. Cal and Vonny go through an entire relationship on the dance floor - falling in love, getting married (proposals and weddings have always been good for ratings! ), breaking up, and reconciling. They compete with five other couples, all different types and dance styles, until they're the only ones left standing (literally). Loyal fans (played by Pedro Juan Fonseca, Brittany Parker, and Jaclyn Juola) watch them dance, cheer them on, or jeer at them. One can't help but think of the preponderance of reality shows on TV today; we love watching people try to do something big, and we love watching them fail. COLLIDE Artistic Director Regina Peluso (no relation to History Theatre's Artistic Director Ron Peluso) choreographed the show, and so much is conveyed through the choreography, beautifully executed by the company. We see the eager young dancing couples (each with a specific personality - one elegant, one funny, one newlywed, one inexperienced, one union organizers), fresh at the beginning of the competition, then watch them grow weary as the sleep-dance their way through the competition, barely able to stand. As I'm sure did not happen in real life, there was also dancing during the breaks, as dream sequences, or explorations of the dancers' feelings. I particularly loved the scene in which they ate while dancing. I have an aversion to fake eating on stage, but these dancers not only really ate on stage, they danced at the same time. Bravo! 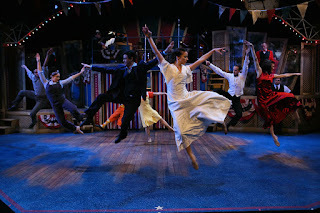 Period costumes (designed by Amelia Cheever) help to create the specific identities of the characters, looking great while still allowing the dancers to move. 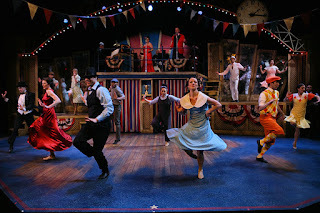 Rick Polenek's festive Americana set provide a great space for the story, including a large dance floor with an elevated bandstand directly behind it, and raised platforms on either side. Director Anya Kremenetsky (completing the female triumvirate creative team) stages the scenes well, making use of the aisles, and keeps the story rolling at a brisk pace while letting the dancing be the focus. 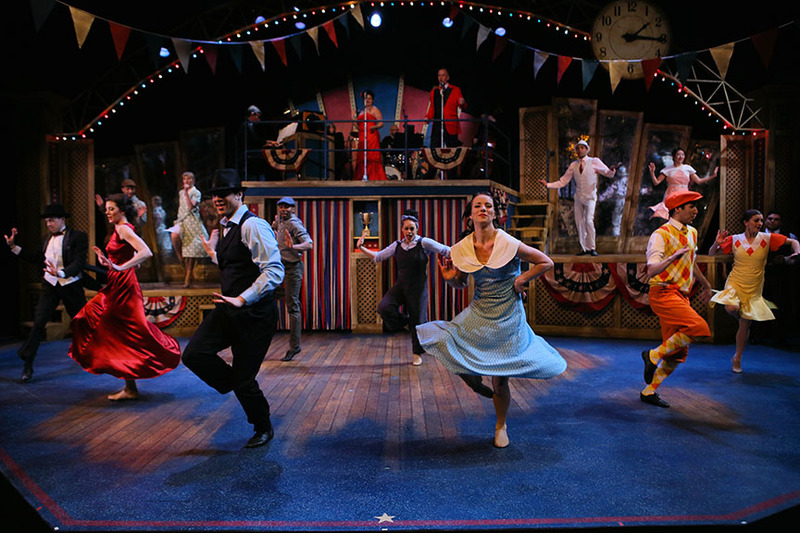 If you're a fan of history, or dance, or reality TV, or incredible feats of stamina, visit the History Theatre in St. Paul to experience this fun and inspiring true story, gorgeously told primarily through dance. Dance 'Til You Drop continues through April 15.